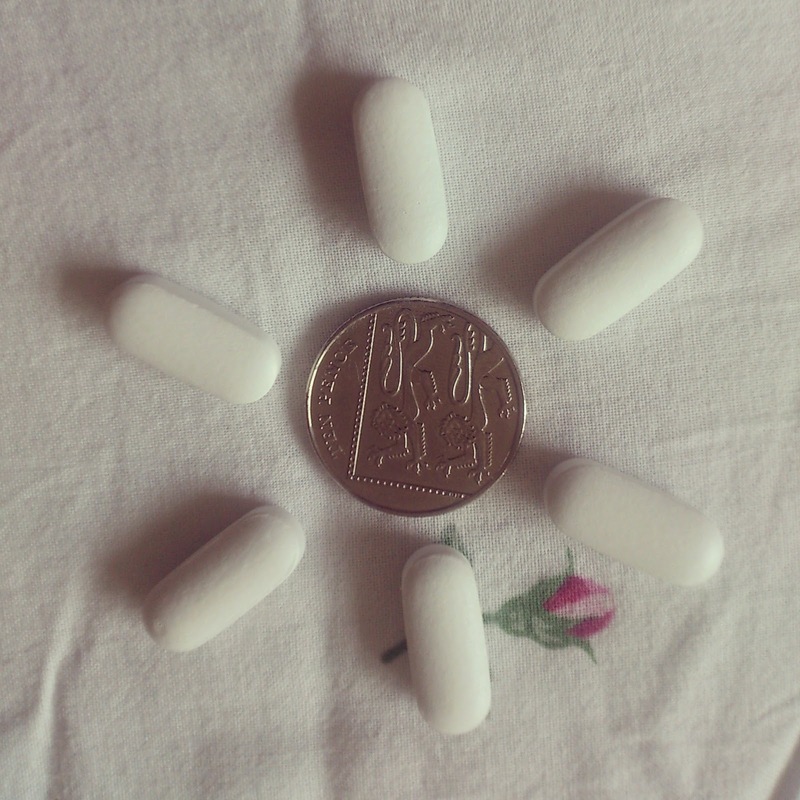 I'm not sure if any of you have tried taking vitamins before, but it is something I am relatively new to. 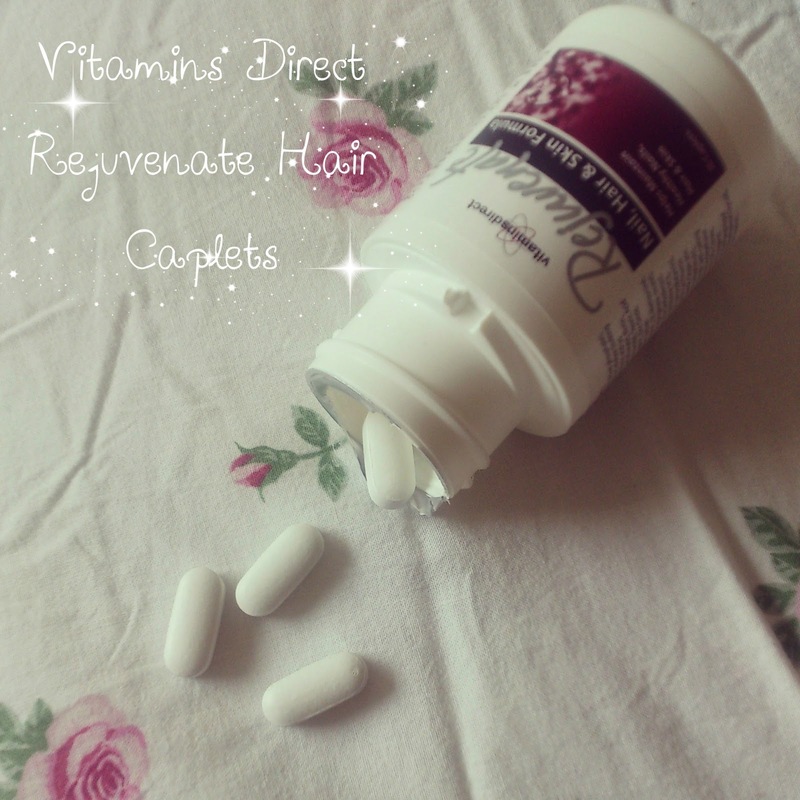 I was so excited when the lovely people from Vitamins Direct Online contacted me to see if I'd like to try a bottle of their 'Rejuvenate' Nail, Hair & Skin Formula Caplets! These Caplets are advertised mainly on the good that they do for your hair, so I was eager to try them out. I have always been scared to get my hair cut, so, as you can imagine, going so long between cuts doesn't leave the hair in the best condition it could be! I was excited to see the benefits for myself and when I showed my mum the bottle she was very jealous so I got her her own bottle for mothers day and she is still taking them every day! The bottle costs £6.95 and contains 30 Caplets - but if you enter the code 'EMMA5' at the checkout you will get 25% off, making them just £5! This is a permanent offer! When I opened the bottle it was sealed with a film, which I really liked as it shows that no one has tampered with it or used it before! 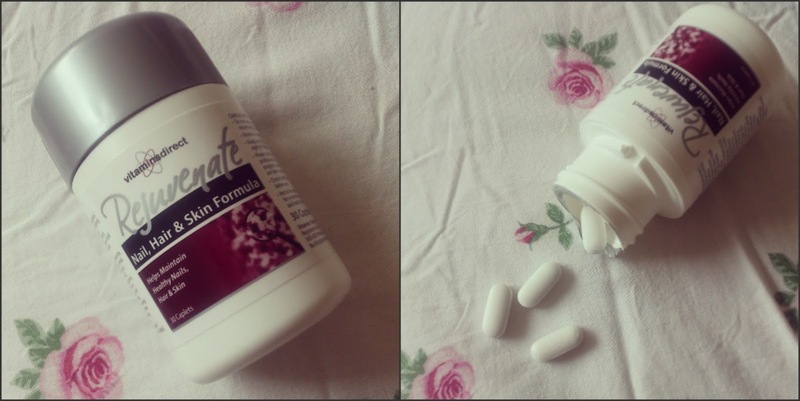 I did notice the smell of the tablets when I opened the bottle - it is quite strong and has a typical 'vitaminy' smell, but it didn't put me off using them. They do have a taste to them, but I took them with squash so that I couldn't taste it in my mouth! As you can see, the Tablets aren't too big and you can break them into 2 parts to take, if you do find them too large to swallow! Vitamin B12 which is great for the formation of healthy red blood cells to transport oxygen to the scalp and follicles. I cant believe they fit all that into one tablet! Haha! 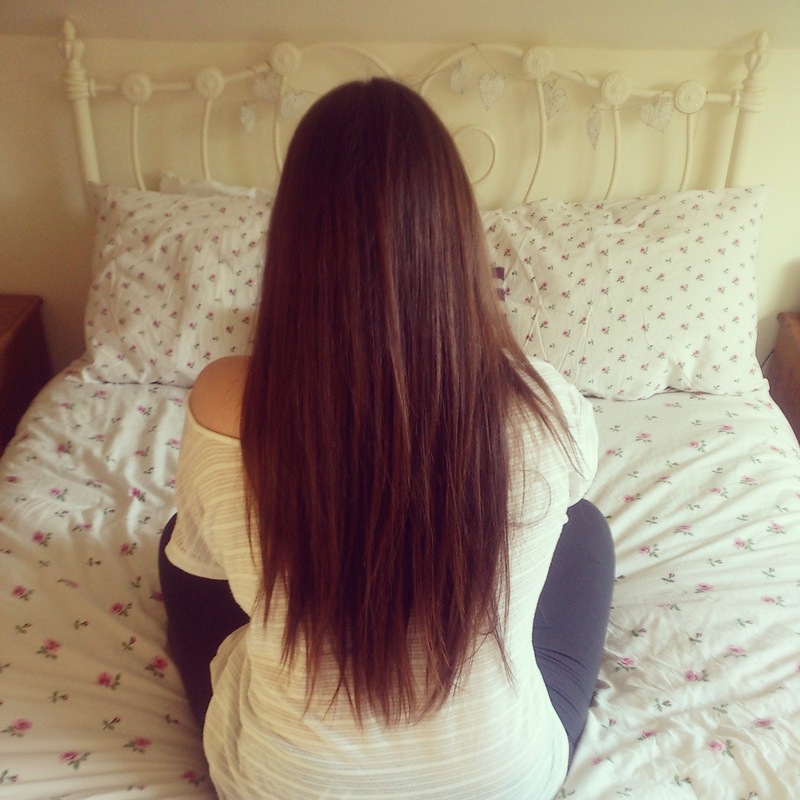 As I said before, I am scared to get my hair cut, so it is very, very long, but these tablets have helped it greatly! I usually wash my hair every 2 days yet it always seemed to be limp, but these tablets have helped it to be more glossy and 'full'. Even though I hardly cut my hair my ends don't really split, but even so, since using the tablets I have noticed that the ends seem less stray and straggly! I can't comment on skin improvements as I am quite lucky to have generally good skin, but it sure has made my nails grow too!My nails used to get to a certain point and just snap but now they seem stronger and more resilient - I love it! If you would like to try these Caplets out, you can visit the VitaminsDirectOnline website here, or you can follow them on Twitter here! I spotted this post over on Meaghan's blog (see it here) & really wanted to give the tag a go myself! 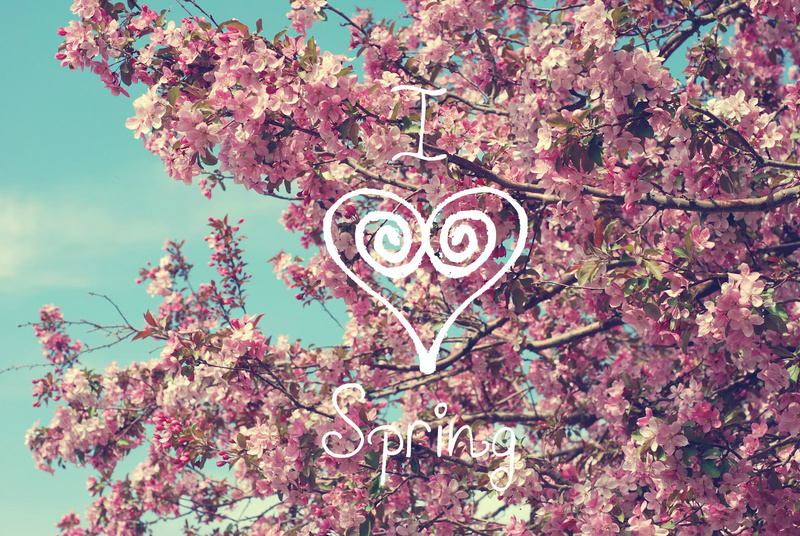 These sorts of posts are great as they are a fun way for you guys to get to know me a little better and this one in particular is a lovely way to talk about all the beautiful things that spring brings! So, here are the tag questions! I am all about Models Own speckled eggs this season! They really encapsulate the spring feeling and are so cute! They dry so quickly and don't chip for days! My favourite shade is Magpie! What is your must-have lip color this spring? I don't really wear Lip colours if I'm honest, but when spring comes around I like a little hint of pink so I am really loving the ELF Long wear Lip Liner in Mauve Luxe - I just fill my lips in with it, it is a beautiful pink hue which looks perfect topped with some lip balm! Its not really warm enough to wear dresses just yet - but that doesn't mean I haven't been shopping ;) All the highstreet stores are full of beautiful sun dresses! I love this one which I got from forever 21 - I got it last year but they have lots of sweet dresses this year too - and their prices are great! Oh, there are so many beautiful flowers around this time of year - I love to see everything in Bloom <3 But I guess I am most attracted to tulips at the moment - they come in loads of colours and are pretty cheap too, actually! 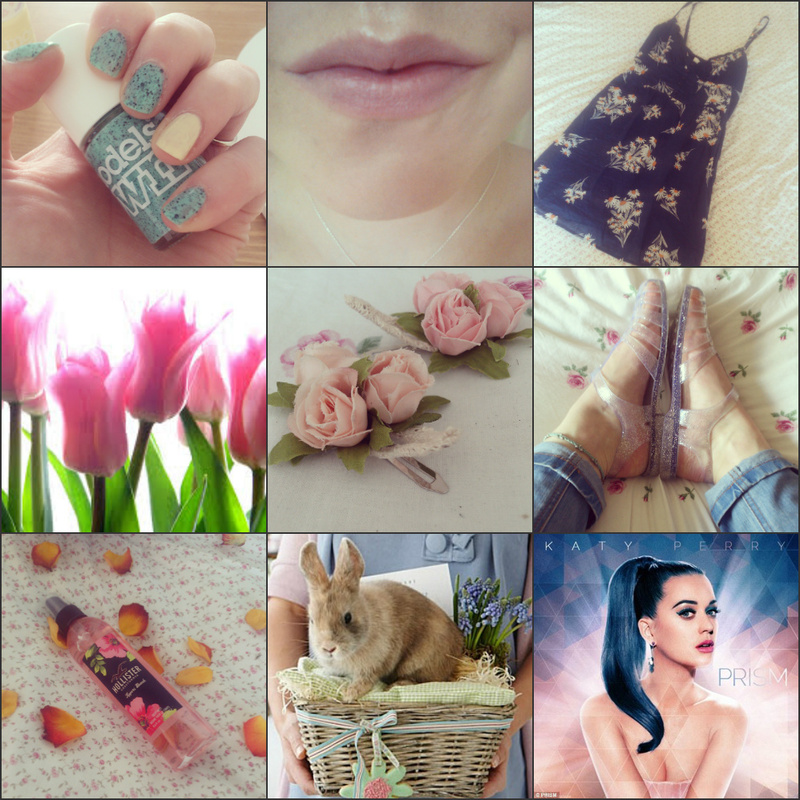 I think spring accessories are so cute, all pastel coloured and dainty <3 My absolute favourite is my floral and twine hair slides that I picked up in Primark - they were only £2 and they go with everything! Favorite body spray/perfume for spring? That's tough as I love fragrances! But In spring/summer I just like something light so I think it would have to be the Hollister body mist called 'crescent bay', its all fruity and refreshing! Spring is - unpredictable. Its been such lovely weather this last week or so, but England being England, it could turn to 'April showers' any moment! I love walking outside and seeing all the blossoms and new life. Nature is beautiful in Spring! I also love Celebrating Easter! Not really, I clean the house anyway, but Spring does always give me an urge to decorate, hehe! I hope you guys liked this post and I hope it helped you get to know me a little better! How would you answer these questions and is there anything else you would like to ask me? As you saw in my Lush Bunny Bubble Bar Post (here), I love Easter special edition products - they're always cute, girly and pastel coloured! So, imagine my excitement when I spotted the launch of the Models own speckled egg Nail polish collection! 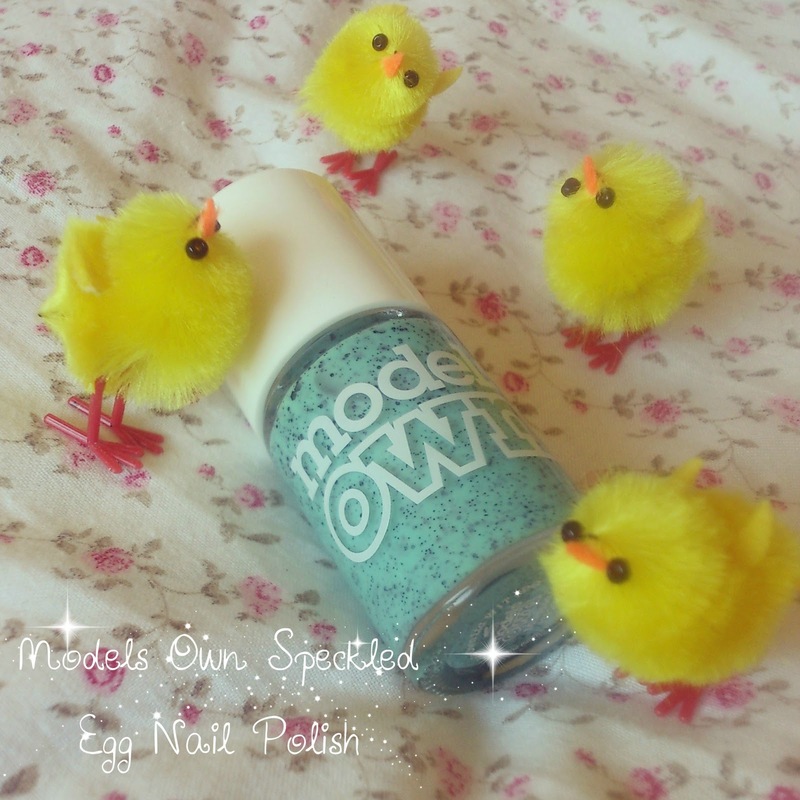 Models own are a brand that I am still fairly new to, I have already fallen in love with their scented nail polish collection and I just couldn't resist picking up something from the NEW speckled egg collection. It was so hard to chose a colour - they are all pastel coloured just like mini eggs - but in the end Dan treated me to this shade called 'Magpie'. The polish is a lovely consistency - not too thin and, surprisingly, not clumpy even though it contains glitter pieces! The glitter pieces are matte black and in various sizes to mimic the random speckles - I love that your nails will be unique each time you use this polish! Illamasqua released a speckled polish line last year which were very beautiful but as they were £14.50 each I just couldn't afford to get one - so I was super happy when I realised these are just £5 each! & 'Magpie' which is what I have pictured above! The polish applies smoothly and I was surprised at how quickly it dried! In the image above I have applied 2 coats, as one coat was not quite opaque enough. The polish lasts a good 3-4 days without chipping, which, for the price, I am very impressed by! I really love the finish of this polish, it is semi matte, but you can make it shine by adding your favourite top coat, too. Now that I have seen how cute this one is, I am so tempted to try the other ones, I think they'd look so lovely mixed and matched on your nails - perfect for the spring time! 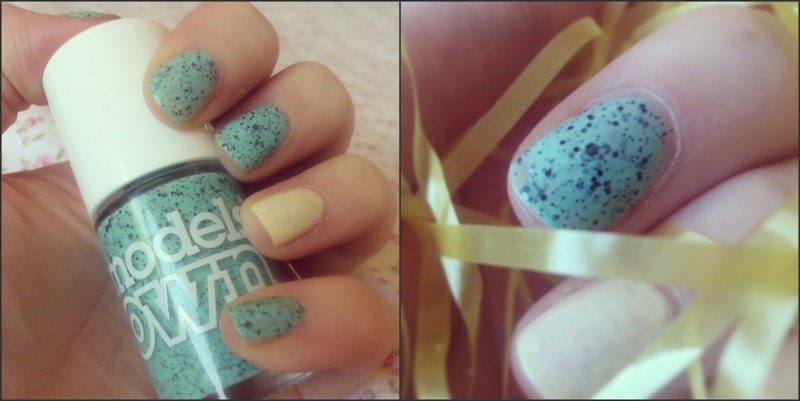 You can shop the Speckled Eggs collection in Superdrug or on the Models Own Website Here. 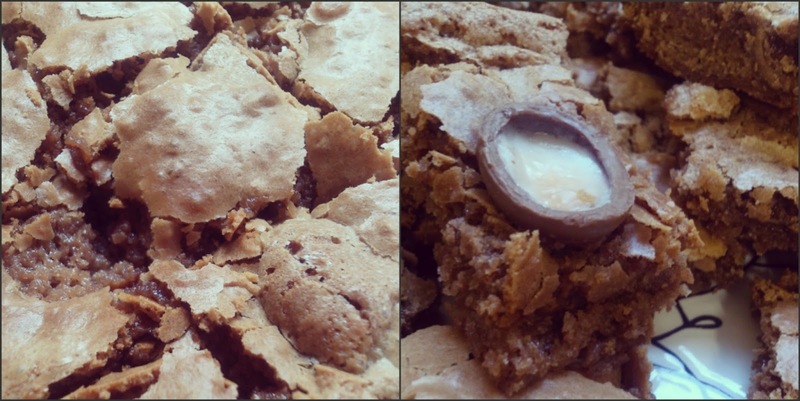 Easter | Creme Egg Brownies! 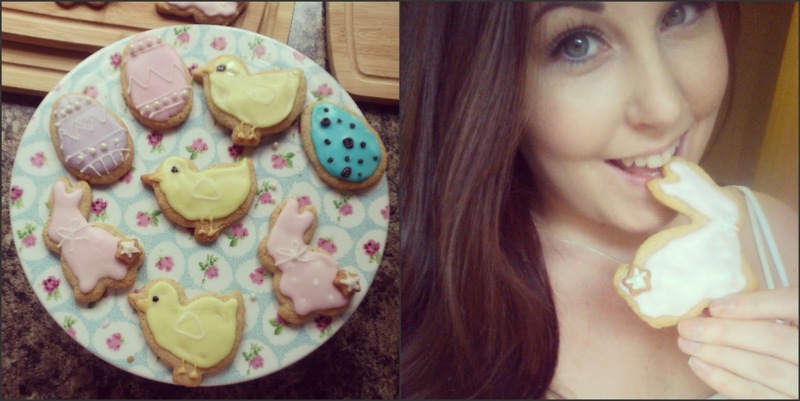 As Easter is just a few days away I thought I'd share another of my favourite festive recipes with you! This is a great time of year for baking sweet treats and I never met anyone who didn't like Creme eggs so these brownies are sure to go down well with friends & family! 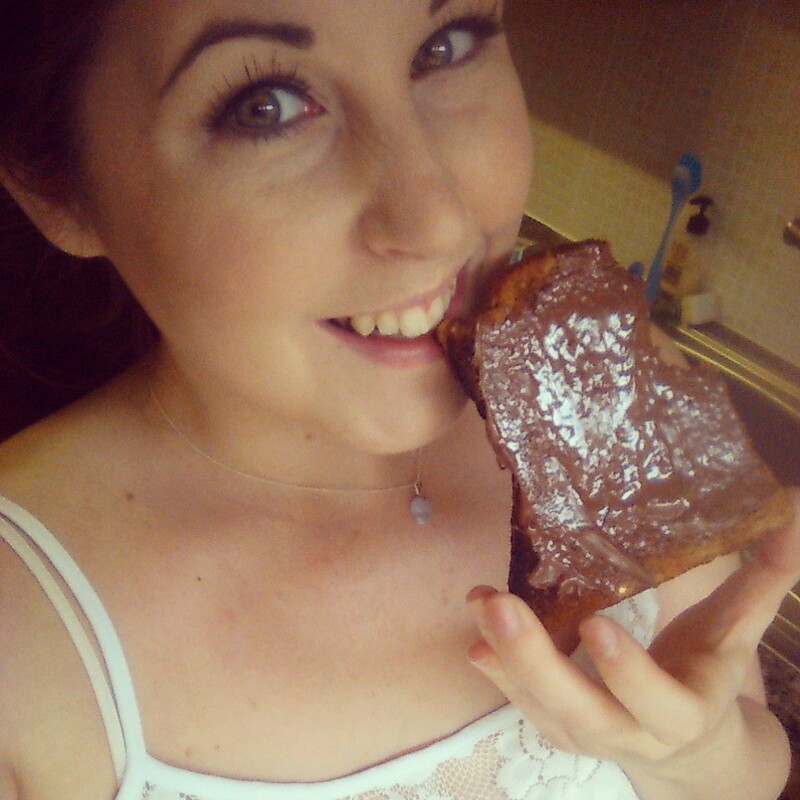 I have made brownies before, but these have to be my all time favourites! 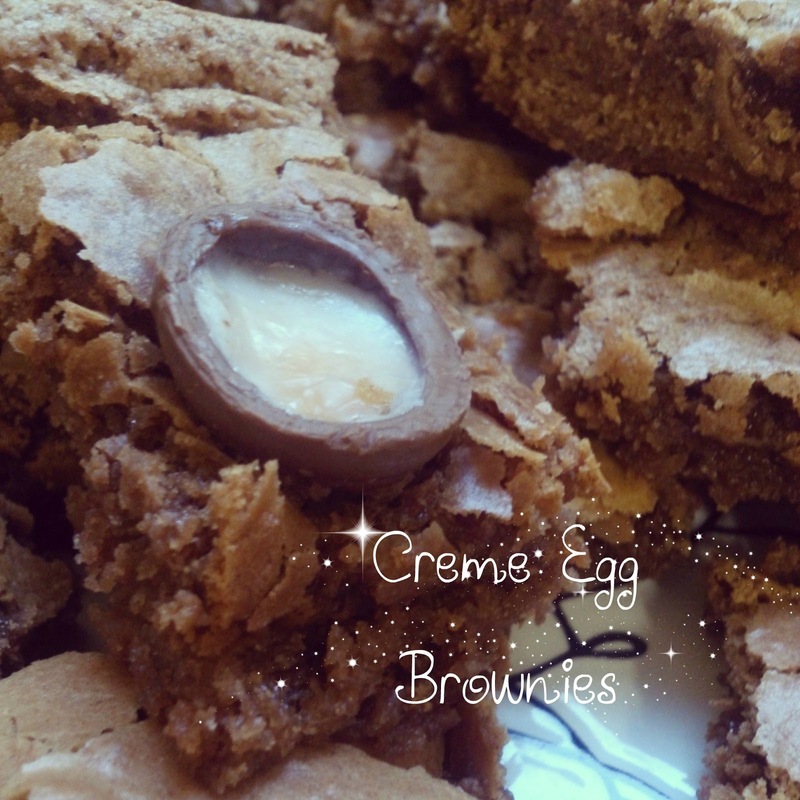 They are crispy on the outside, chewy on the inside, gooey from the Creme Eggs and oh-so chocolatey! They're a great alternative gift rather than store bought Easter eggs and are just so tempting - my mouth is watering thinking about them! Once you've gathered all these, you're ready to go! Before you do anything, Preheat your oven to 160C/Gas3/325F. 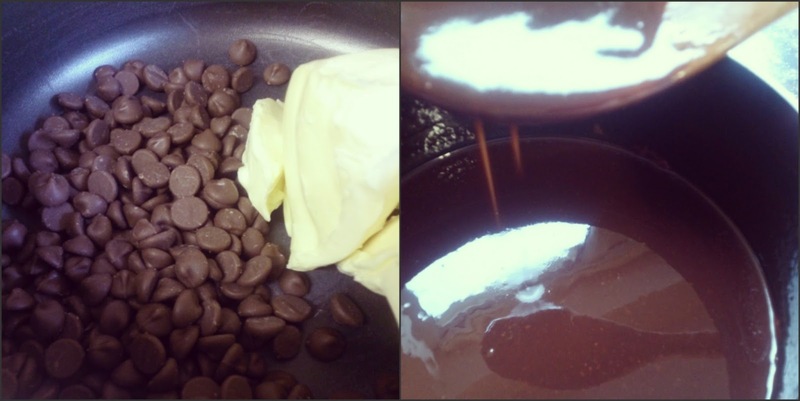 while the chocolate is cooling, mix together the eggs and the sugar in a separate bowl until they are light, then add in the vanilla and the salt and stir until combined. Then you can gradually add in the flour, a little at a time until it is all combined thoroughly! 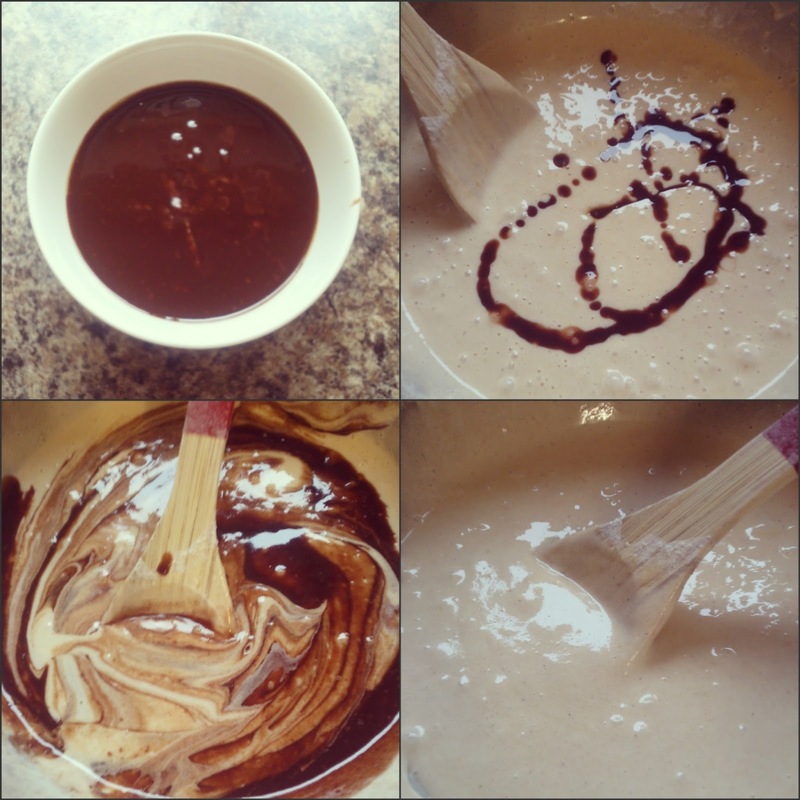 Next, slowly add the cooled chocolate into the mixture and gently stir until it is fully combined! Ohh it just smells so gooood! You need to pop the mixture into the oven for 15 minutes and then remove it - it will still be soft and not cooked all the way through but don't panic, this is how its supposed to be! 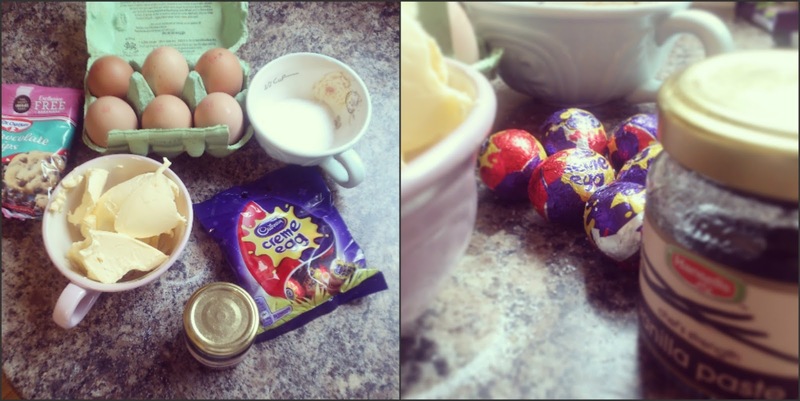 Once you have removed the brownie from the oven you can chop your Creme eggs into half and spread them out evenly on the surface of the brownie, just push them in a tiny bit - not so much that they are submerged. Now put the brownies back into the oven for another 15-18 minutes. You will know when they are cooked through because a toothpick inserted into them will come out with moist crumbs! 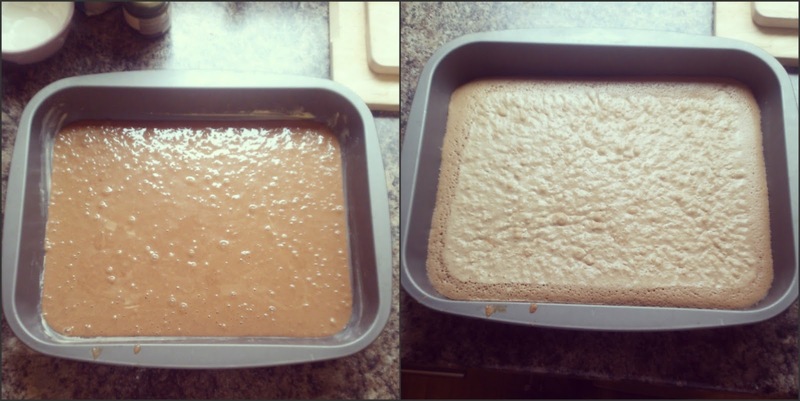 Allow your brownies to cool slightly and then cut them up into whichever size bars or squares you like! They are so yummy, warm or cool and you just cant stop at 1! 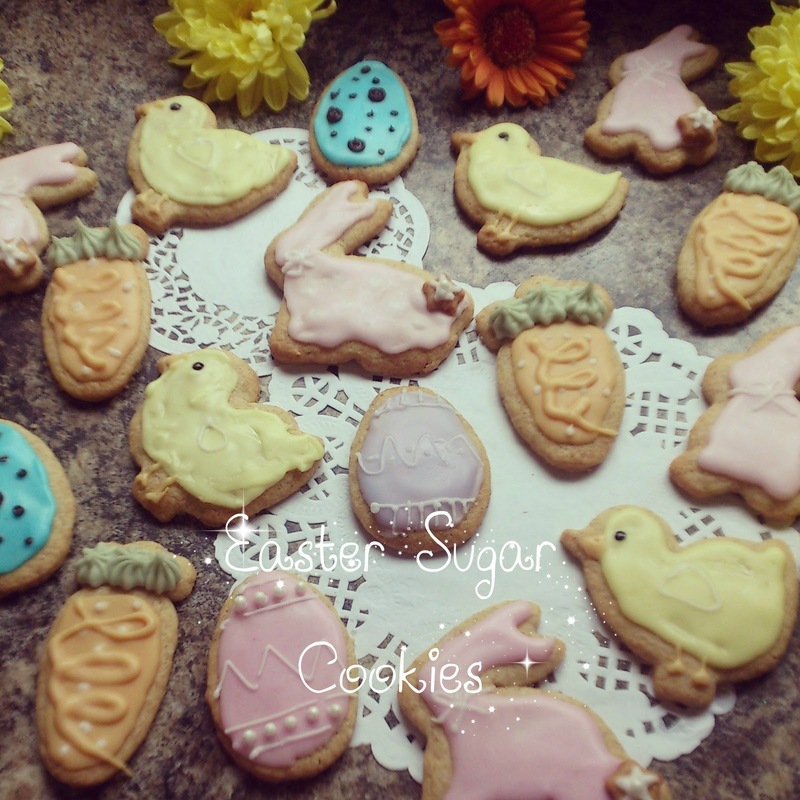 I hope you guys enjoyed this easy Easter recipe - If you want to see some more come on over to my Facebook page (here) and suggest me some ideas! I love a Challenge! I always look forward to Easter time as a lot of company release special, limited edition Easter themed products! And I was not disappointed when I visited LUSH last week and spotted their Easter line! I always love the little bags that LUSH wrap your products in, it comes with a little sticker telling you about the product inside - this is especially nice if you are giving the product as a gift! 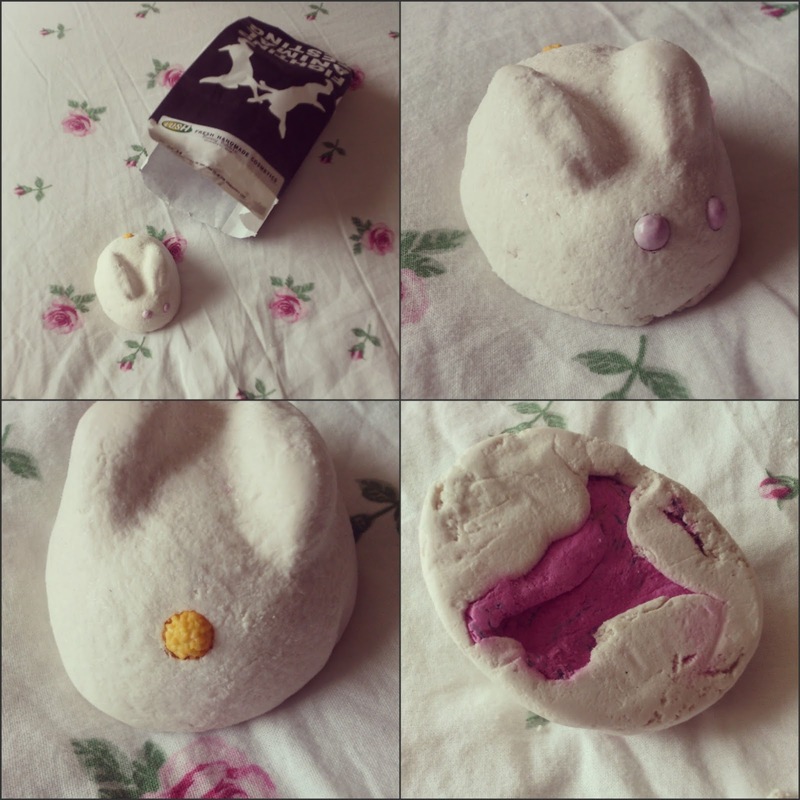 You dont even need to open the packaging to be engulfed by the enchanting scent of the Bunny bubble bar! If you have tried the LUSH Christmas exclusive 'snow fairy' before then you will understand how good this bunny smells as it has a very similar (slightly toned down) scent! If you're not familiar with it then think, candy floss rolled in sugar and spritzed with some vanilla! It is just dreamy and you literally cant stop sniffing it, its as though your bathroom has been transformed into a candyland! The Bubble Bar contains Extra virgin Coconut Oil, Cornflour, Fair Trade Shea Butter, Fair trade Vanilla Absolute and perfume! The bunny bubble bar reminds me of the little white rabbit from Alice in wonderland! It fits perfectly into the palm of your hand and has 2 cute purple shimmery eyes and an adorable cotton tail, too! It is made from and outer shell which creates squillions of bath bubbles and if you flip it over you can see some of the lovely pink peeping through - this is what will give your bath water a magical colour! It is also infused with some cute cornflowers to surround you when you're relaxing in your bath <3 The water is so soft and leaves your skin feeling amazingly refreshed and nourished! LUSH got it so right when they made this little guy! 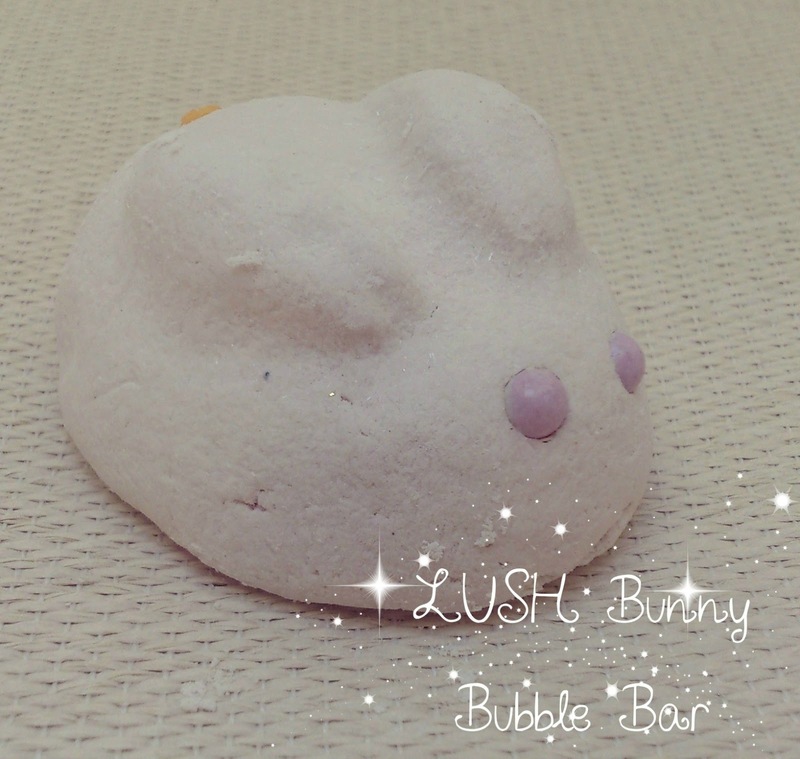 The Bunny Bubble Bar costs £3.25 - it may sound a little pricier than your average bottle of bubble bath, but this bar can be cut into smaller chunks so you can use it to infuse more than one of your baths! 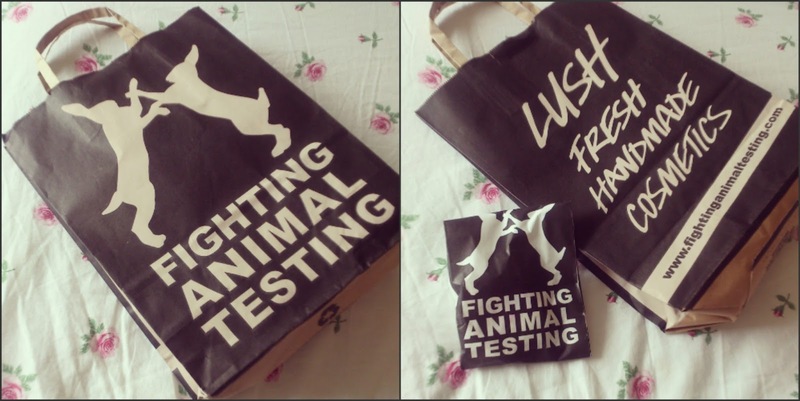 I also don't mind paying that little bit extra as I know that all LUSH products are NEVER tested on animals and are only made from natural ingredients that wont harm your skin! LUSH also hand make their products so its nice to know that no 2 are exactly the same! You can have a look at the whole LUSH Easter range here or you can browse the entire site here! What is your favourite Easter Product? Hi There My Honeybee's - I hope you're well! Today was such a lovely day so I thought I would make my first 'Get Ready With Me' Post & Take a Walk around the New Village Dan & I have moved to! This post will feature a fresh & simple Make Up Look for Spring which is easy to create and so pretty! So, the first thing I do when I get up, is step into my cute teddy bear slippers - they're all fluffy and warm! I like to light some candles - as you can see this pineapple one from IKEA has been my favourite lately, it smells amazing and so tropical! I also head on downstairs and make myself a fresh, clean, fruit smoothie to drink while I'm doing yoga! I then start my skincare routine by cleansing and exfoliating my face with the L'Oreal 'Go 360 clean' products, toning and applying my favourite NIVEA face creme. Then its time to Brush, Brush, Brush with my Colgate ProClincial C600 Toothbrush (see my full review here). 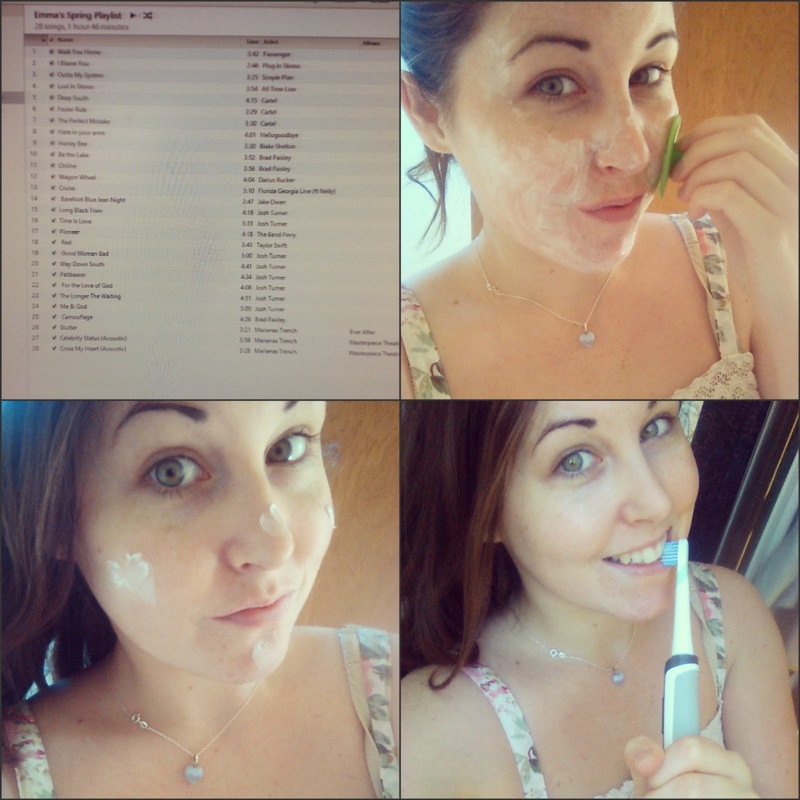 It's so important to care for your skin and teeth in the morning and it only takes a few minutes so don't skip it out! Okay, now that skincare is complete lets start with makeup! I am first using my Revlon Photoready makeup primer allll over my face and applying with my fingertips! 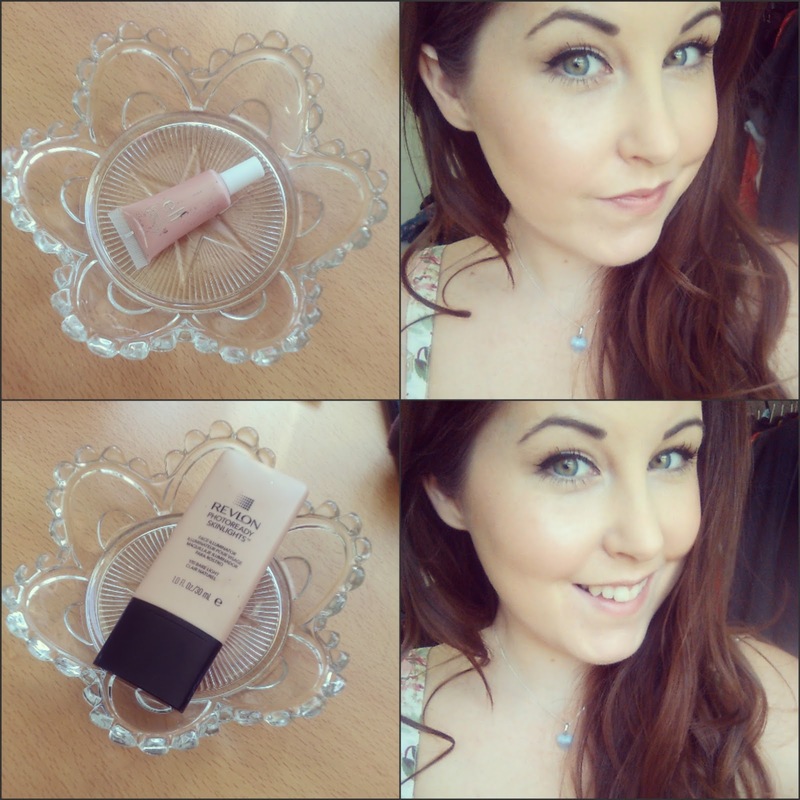 Its so soft and really blurs my skin to cover any imperfections! This look is going to be light and fresh so I am not going to do a contour&highlight routine, I am just covering blemishes and dark areas with my Collection cover up stick concealer! Next, I am going to apply a light cover of my Revlon Photoready foundation - just one pump will do! I am buffing this all over my face with my Real Techniques expert face brush. 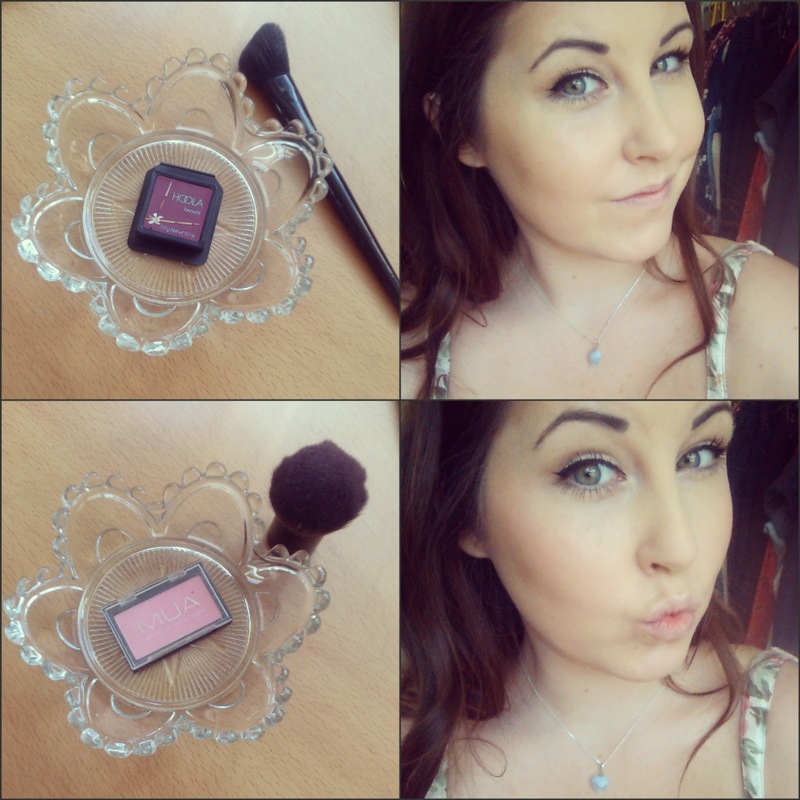 The combination of this foundation and brush gives a really smooth and flawless application! Then I am just going to give my face a light spritz of this ELF mist and set spray - this will help my makeup stay in place when I'm out in all the fresh spring air! Lets give this a sweet matte look! I am dusting this Collection sheer loose powder in 'translucent' all over my face with my Real Techniques powder brush! This not only gives a great matte finish but it also helps to keep make up from sliding around your face! To prepare my eyes for eyeshadow I am just dabbing some concealer onto my eyelids with my finger -this will keep my eyeshadows in place and give a nice even base cover to work from! Now I am taking this amazing Day Palette which I got from Primark - it was only £2.50 and has 8 great eyeshadows with great colour payoff! From the same palette, I am taking this matte brown shadow and applying it to the crease of my eyelid with my Real Techniques shading brush, this will define the shape of your eye and make them appear larger. You can delicately wing this eyeshadow out to further enhance the shape of your eyes, if you like! Next, lets pick up some eyeliner - you could use any type you prefer! 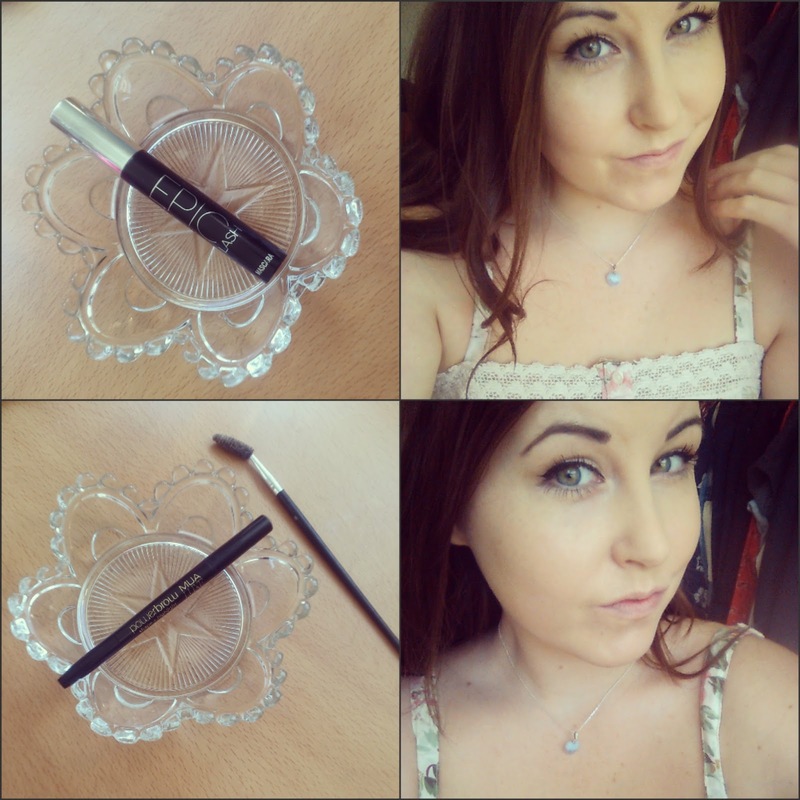 I am using my Collection Eye Definition Liquid eyeliner and creating a subtle feline flick for femininity! I started by drawing a upward diagonal line from the outer corner of my eye, then, from the centre of my eye I drew a line to join up with the flick, then filled this in! You could leave it like this or you can continue the line downward toward the inner corner of the eye, like I have done! 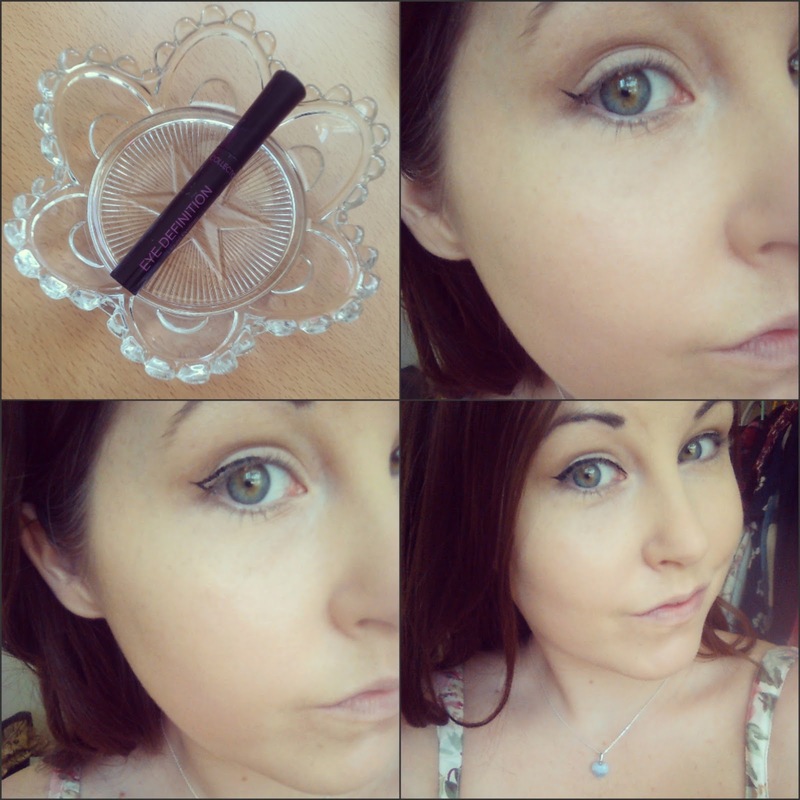 To finish off my eyes, I applied a swipe of my favourite mascara - EPIC lash by Victoria's Secret! This really makes the eyes pop and makes them extra girly! I also framed my eyes by filling my brows in and enhancing the shape, I am using my brow brush and my most favourite ever brow tool - the MUA power brow pencil, this is great as it is easy to handle, steady and comes in a good range of shades! Lets move on to the cheeks! I started by taking my Hoola bronzer by Benefit and my angled contour brush by MUA and I gently contoured my cheeks and temples - this gives good structure to the face and stops it looking 'flat' and one dimensional! I followed this by applying some candy pink blush to the apples of my cheeks with my kabuki brush! 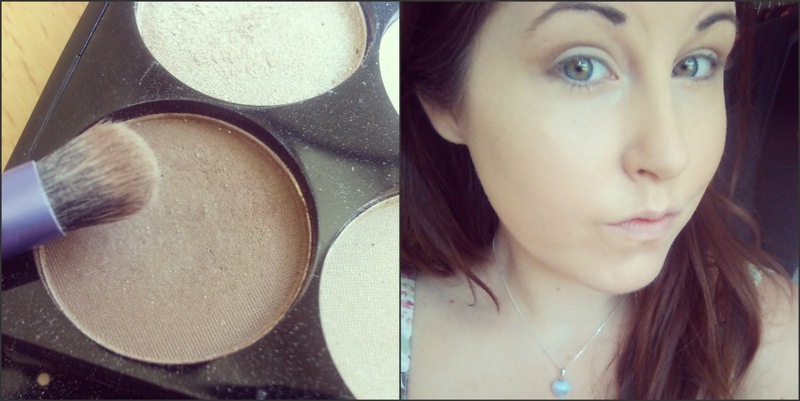 I am using MUAs powder bluish in shade 'Marshmallow' here! To define my lips I am filling them in with this ELF Long wear lipliner pencil in shade 'Mauve Luxe' - this is a wonderful pinky purple shade which really compliments fair and dark skin tones alike! I have left my lips like this but you could top them with some lip balm or lip gloss if you like! Annnnd, to finish the look I am doing some gentle highlighting! I am first going to dab some of this gorgeous ELF facial whip in shade 'Lilac Petal' to the apples of my cheeks, it has a sweet rose hue and is opalescent in the light <3 dreamy! You only need a tiny bit of this as it goes a long way. The last step is to pick up my Revlon Photo Ready Skinlights in 'Bare' and gently dab a tiny amount on my browbone and cupids bow - this will look so pretty in the light! This makeup is so pretty and natural looking! It is simple to apply but really enhances your natural features and plays on the sunlight! Once your makeup is looking great - you've got to find a pretty outfit to match! Spring time in England isn't particularly warm but it nice to step out of the massive coats and darker fabrics and into floral prints, cheerful colours and sweet footwear! I am wearing these sweet ankle length skinny pale blue jeans from New Look, and matching them with this lovely floral bubble top from Primark (I got this top in Primark last year but floral is all the rage again this spring so you can pick something similar up almost anywhere!). This outfit is breezy, pretty and comfortable, all whilst being practical! You can add a cardigan or kimono on top to keep warm and whip it off when the sun comes out again! I also like to keep my fragrance light in the warmer months - nothing too overpowering! 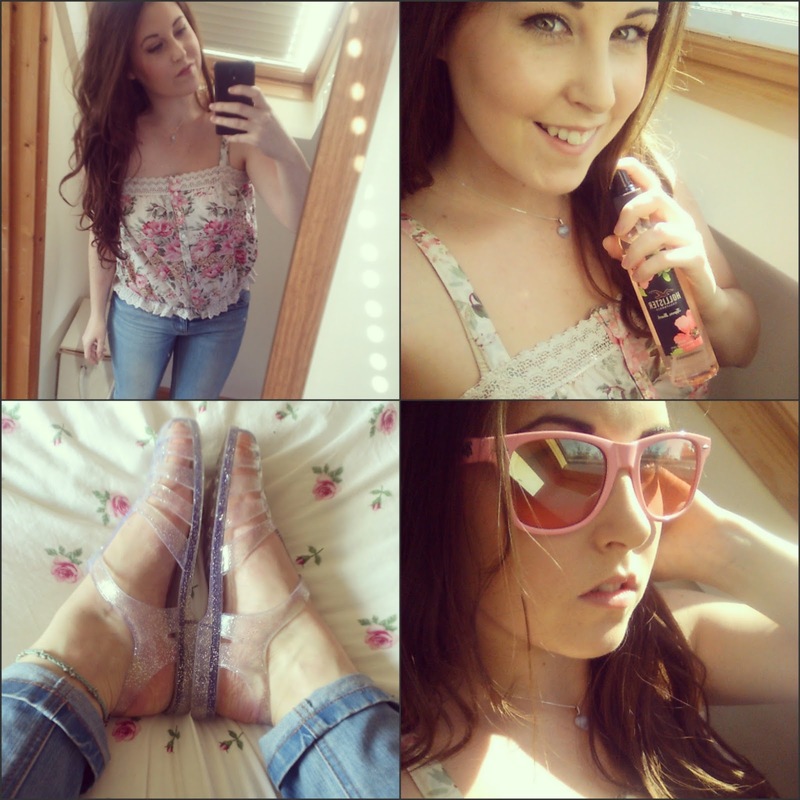 I am spritzing on this lovely scent from Hollister - it is called 'Crescent Bay' and it is so summery and sweet! As for shoes, I am stepping into my cute sparkle jellies which I picked up on eBay last year - however these seem to have become very popular lately and you can find them in most fashion stores for about £10! These are comfortable and go with everything! I also want to protect my eyes while out and about in the sun so I am putting on my Pink Ray bans ^_^ I love them so much! Dan & I moved to Clanfield in February, and although we have been here a few months now, I haven't had much of a chance to look around because the weather hasn't been too great, so today was a great opportunity for me to go out and explore the village! I walked a little further down the roads (which are always empty and safe to walk up the middle of by the way!) and saw so much beautiful wildlife and nature. Flowers are blooming everywhere and birds sing sweet songs. I love being able to look out over green, unspoiled fields and farms without a sky rise or house in sight and breathe fresh, unpolluted air! 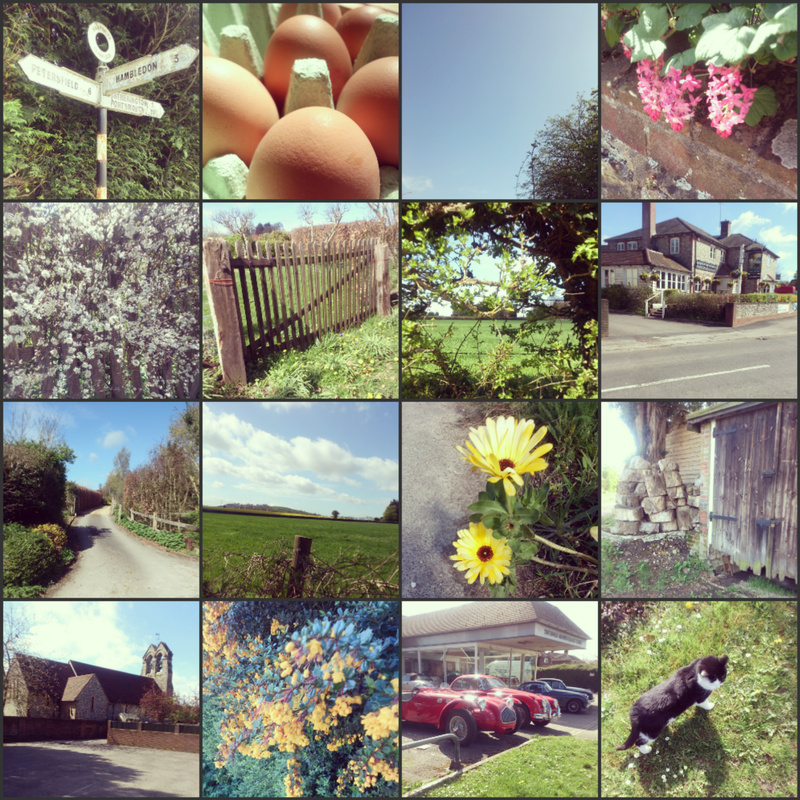 I stopped to take pictures of some of my favourites sights around Clanfield, there are wonderful old houses with barns and log stacks, pretty wooden gates and country roads leading to farms and fields alike. I visited a farm which were selling freshly laid eggs from chickens, ducks and geese, all born and raised on the farm, for only 17p each! Our new home is lovely and I cant wait to spend more time outdoors around the village now that the sun is showing its face more often! I hope you enjoyed getting ready with me & let me know if there are any tutorials you would like to see me post! 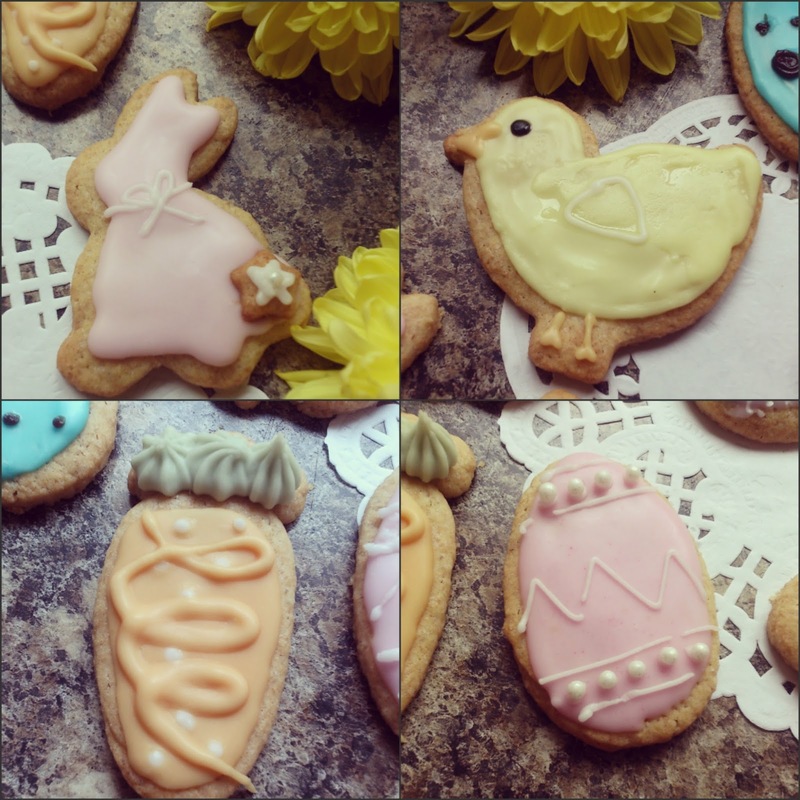 So, I made some Easter Sugar Cookies & they just turned out sooo yummy that I wanna share the recipe with y'all! 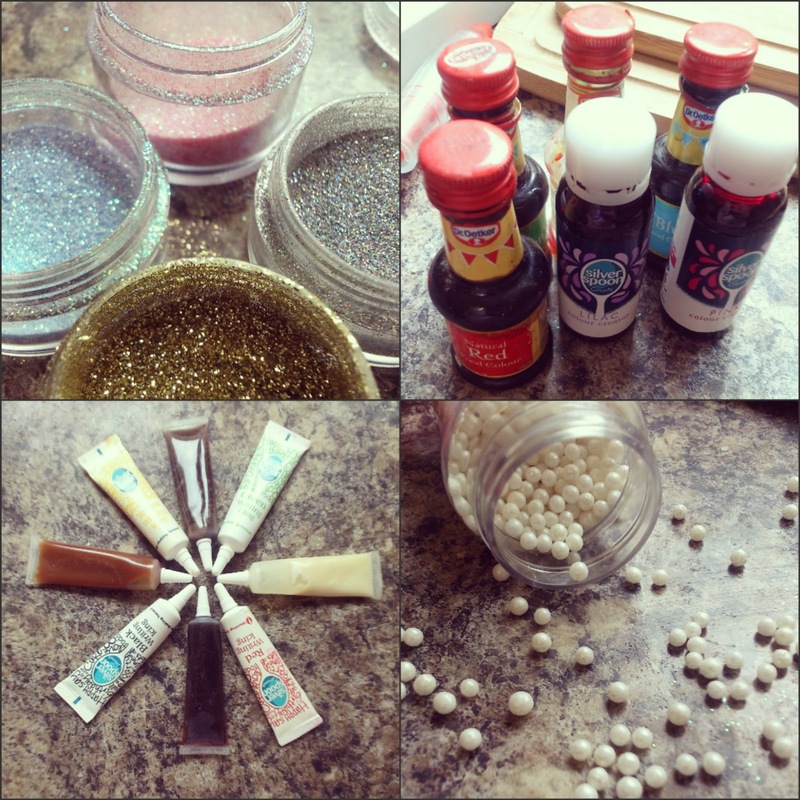 They are so easy to make and you can decorate them in so many ways so be creative and messy! This will make around 20 cookies! 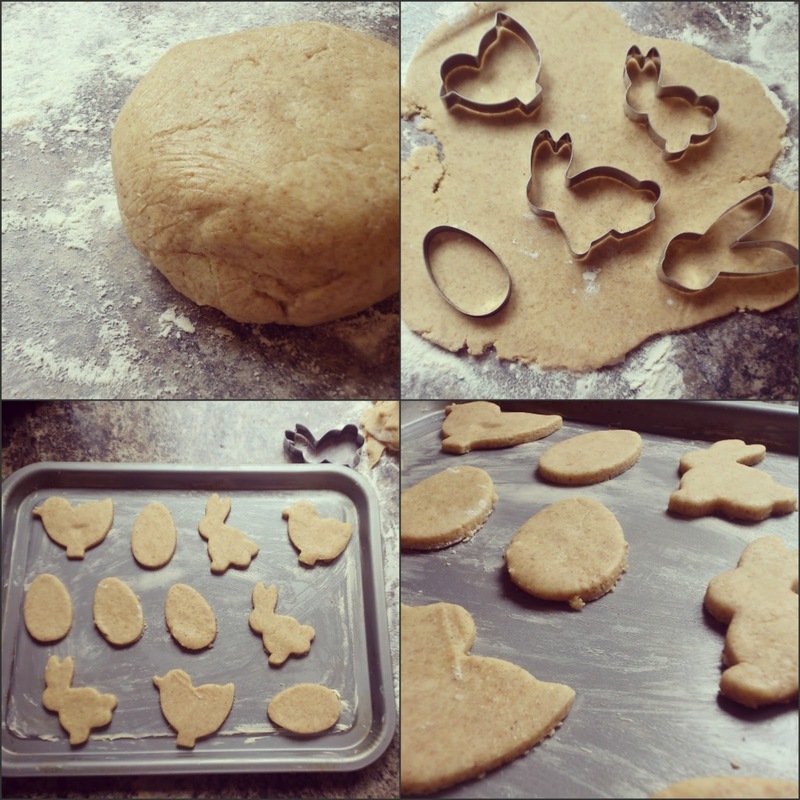 You will also need some Easter themed Cookie cutters - just like these from Lakeland. 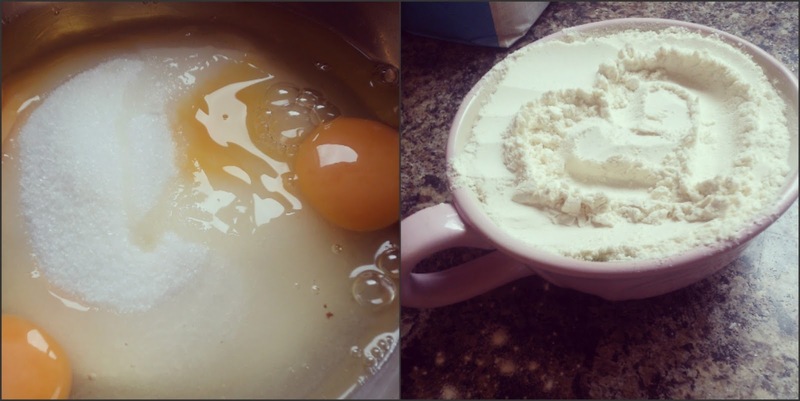 The first step is so cream together the Butter and sugar - make sure they are really well combined. Then you need to add in the Beaten egg and vanilla and mix until you get a creamy consistency. Finish this off by sprinkling in the salt and sifting in the flour and baking powder. Now you need to gather allllll the dough into a ball, cling wrap it and put it into the fridge for about 30-45 minutes, this will allow it to get nice and firm. Once the time has passed, pre heat your oven to 175C/350F/GasMark4, this way the cookies will get an even amount of heat over them once they are put in the oven :) You will also need to grease your baking tray - I just used some butter to do this! Then cut out your shapes and place them onto the tray - make sure you leave a gap between them, though, so that they don't join up when they are cooking! It took me 3 trays to bake all my cookies but it's better to do this than have them all joint up! Now you just need to pop them into the oven for 8-10 minutes (or until golden brown!). After you haver taken them out of the oven just let them cool on the tray for 5 minutes, then you can scoop them up and put them onto a cooling rack or plate! They look so cute when they come out of the oven and are good enough to eat already - but try to resist!! 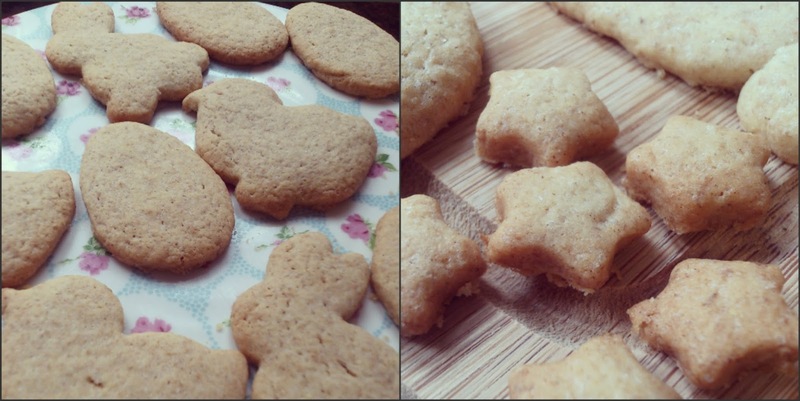 I Baked some tiny star shaped cookies, too, to make my bunnies cotton tails! Whilst the cookies are cooling its a good idea to gather your decorative items! There are so many options, edible glitters, food dyes, icing writing pens, and other edible delights, too! Once your cookies are completely cooled you can start to decorate! I like to put my 'naked' cookies on a plate or cake stand so that you can twist and turn them easily to get to each angle while decorating! I mixed some food dyes to get the colours I needed but didn't have to hand - for example I needed orange so I mixed some red and yellow dyes! 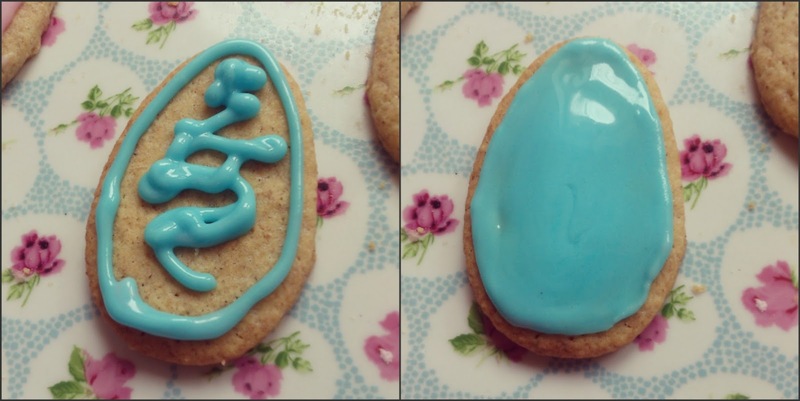 Your icing will need to be fairly thick - but not stiff- so that it stays in the design you want and doesn't run off the edge of the cookie. If you have piping equipment then it is a great thing to use for the cookies but if not you could just us the back of a blunt knife to spread the icing! I am using my piping bag and a very fine round nozzle which easily creates thin lines and detailed patterns. I found that the best way to keep the icing neat was to trace an outline first and then fill in the middle - that way it never spills out! As the icing is a little thicker than usual, you might find it hard to spread, so boil a kettle and put the water in a cup, then sit a knife into it for a few seconds, then use the knife to spread the icing - it will temporarily melt it and make it much easier to move about! You can be so creative and create any pattern you like! I used my white writing icing to create some lines and designs and I used some cute white shimmer pearls to add extra prettiness! When they are all finished they look so lovely! I gave mine to Dan to take to work for him & his friends but I did keep a couple by for myself and they are so buttery and light and yummy - everyone will love them!